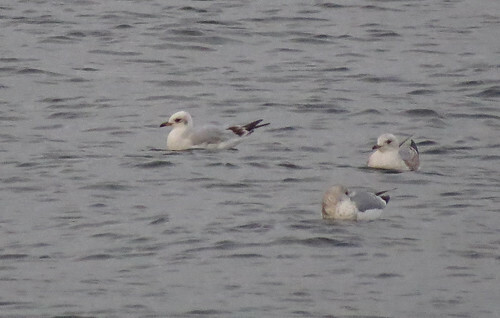 The Mediterranean Gull Ichthyaetus melanocephalus appearances in the Tophill Low NR, East Yorkshire roost continued during the latter part of February and into early March. Once again, there was a turnover of individuals with at least 11 different birds noted between February 21st and March 5th. The first winter above was present on the 21st February while the adult and first winter below were two of the four birds present on March 1st on a very dark evening. The age breakdown for the period featured three first winters, four second winters and four adults. It really is quite interesting seeing birds each evening and trying to work out how many actually go through the roost as mentioned in the previous post. 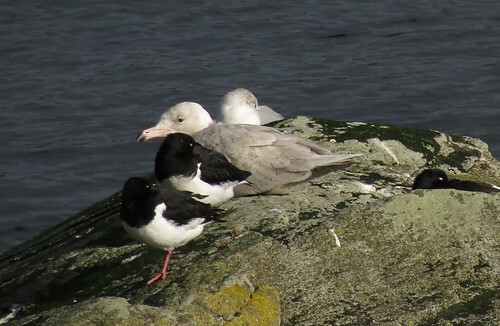 Lesser Black-backed Gull Larus fuscus graellsii are starting to be a more regular feature of the roost with 1-7 birds present each evening, while the appearance of an adult Kittiwake Rissa tridactyla on March 2nd was the second bird seen this winter. Away from the gull roost, the Lepidoptera recording continues. The Chestnut Conistra vaccinii, Common Quaker Orthosia cerasi and Hebrew Character Orthosia gothica all on the wing during February, while two Parsnip Moth Depressaria radiella found on the 27th were something of a surprise given only four individuals had ever been recorded at Tophill Low during trapping/recording history. For more news from Tophill Low NR – check out the blog here. This stunning Glaucous Gull Larus hyperboreus was present at Loch Gilp in Argyll & Bute during late February… maybe one will appear in the Tophill roost during what is left of the gull roosting season!